Try Cleaver - Server provisioning and web app deployments made easy for you. LightPaper lets you write your documents/articles/blogs using powerful features such as markdown, folder navigator, real and live preview, shadow notes, multi-tabs, custom styles, distraction free mode, syntax highlighting, math rendering, full GFM support including GitHub tasks, Jekyll rendering, and more. Whether you are a professional writer, a blogger, a developer, a scholar, or a student, LightPaper has you covered for all your writing and note taking needs. Use LightPaper's powerful folder navigator to open multiple folders and browse through all your documents. You can not only open a document quickly by double clicking it but can also create a new document or a folder, delete files or folders or rename them. Quick Open feature allows you to quickly search through all your files. Favorite a file or folder to have it accessible any time you need it. 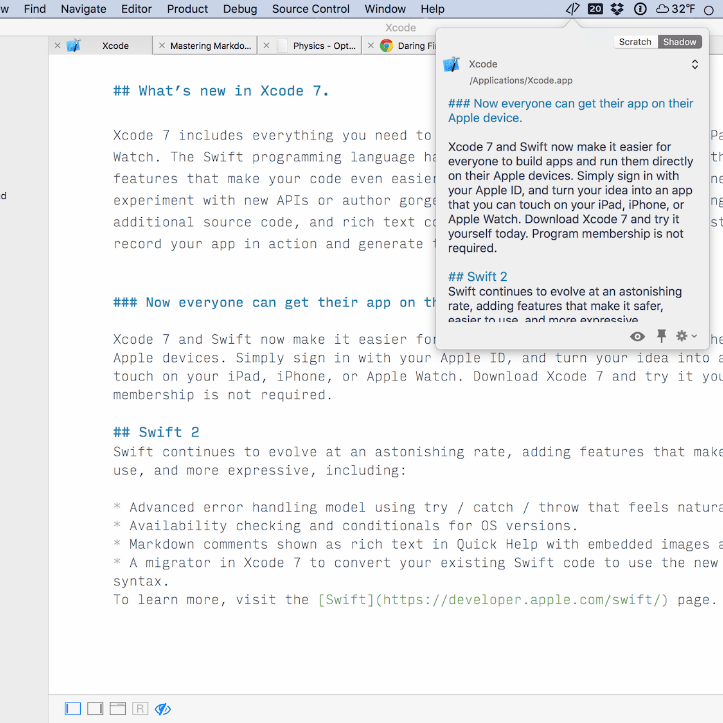 Sidebar also makes all your Shadow Notes and Scratch Notes accessible in one place. One of the coolest features of LightPaper, Shadow Notes allows you to take notes for almost anything. You can take notes for an app, a file, a folder, any browser or even URLs within a browser. With a single click, you can also switch to scratch mode and quickly take draft notes. Both features are easily accessible from your system menu bar and has full markdown support including syntax highlighting and quick preview. After taking notes, open LightPaper to see a list of all your shadow and scratch notes. You can then continue to edit the notes or save them to your local drive as a regular markdown file. With fuzzy search matching, quickly open a document or a folder without having to actually remember its name or navigating a long filesystem tree to it. Struggling remembering the syntax for links and images? Well, just drag and drop them and LightPaper will take care of the rest. List of all the headers and code blocks so that you can quickly jump between them. LightPaper's fast and live preview means you can see how your document is going to look like as you type it. Use pre-packaged styles to change the look-and-feel of your output or create your own. LightPaper also allows you to see a preview in an external window which is great for presentation or if you have an extra monitor. RealPreview, another unique feature of LightPaper, allows you to see how your post would look like on a website when you publish it before actually publishing it. You can add multiple sites as well and switch between them. We call it magic and you have to see it for real! List of all the headers from your preview so that you can quickly jump between them. LightPaper comes packaged with full support for two very popular markdown formats - MultiMarkdown (MM) and GitHub Flavored Markdown (GFM). When you choose MM, you get advance document authoring features such as footnotes, tables, citations etc. When you choose GFM, you get all the awesome GFM features such as tables, fenced code blocks, strikethrough, URL autolinking and even Task List!!! 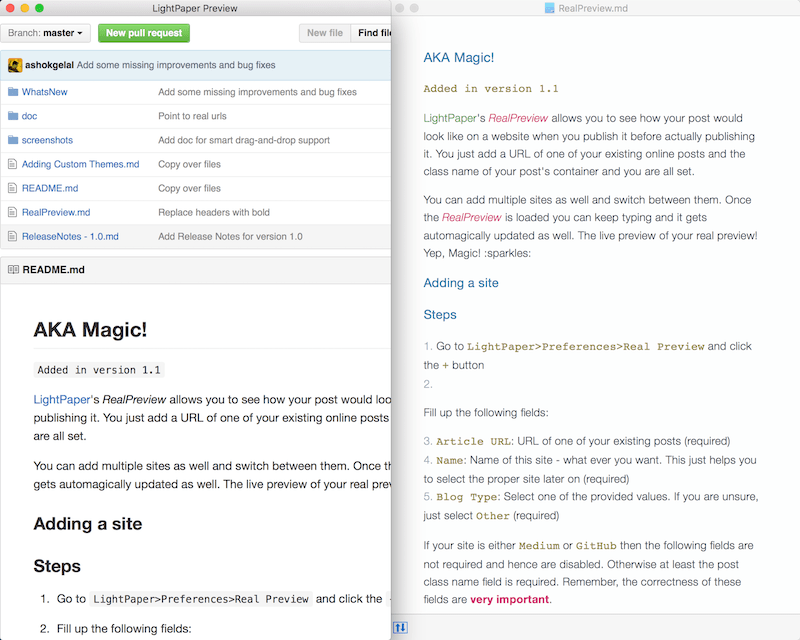 LightPaper supports two very useful third-party plugins PrismJS and MathJAX out of the box. 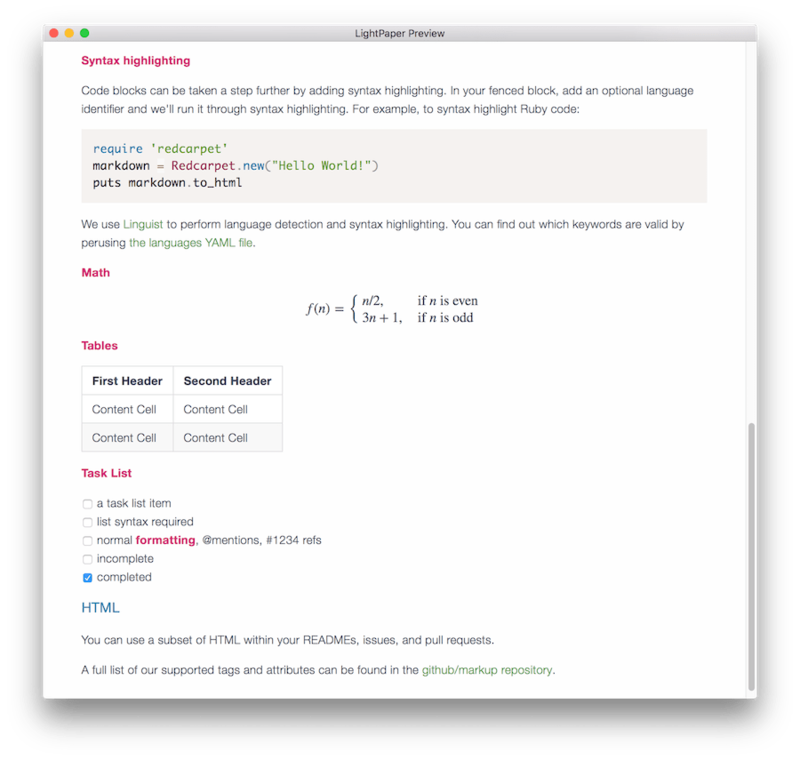 These plugins allow you to highlight your code snippets and render your math equations. Once you are satisfied with your documents, you can easily export the rendered documents in either HTML and PDF formats. 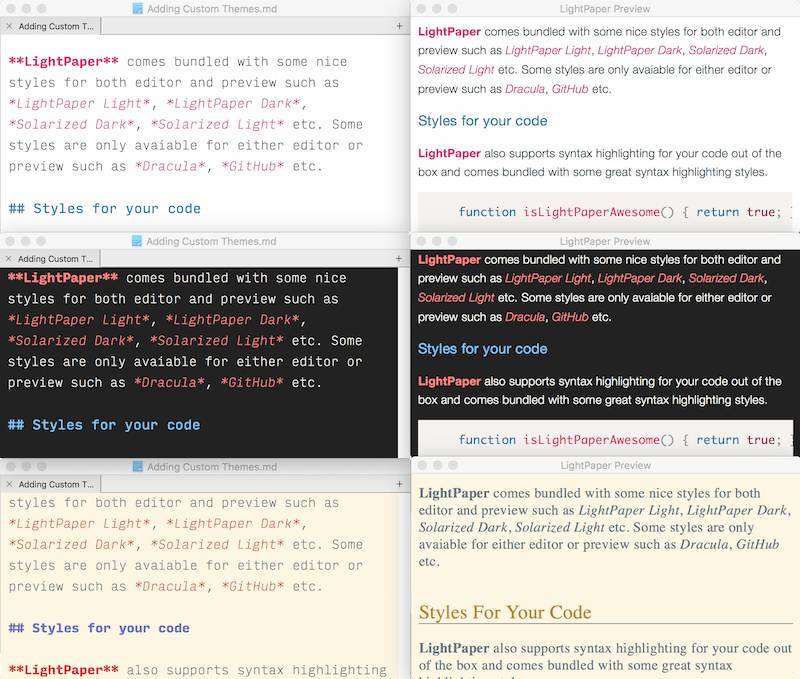 LightPaper takes extra care of Jekyll posts and is very smart when it comes to rendering them. It parses out and creates a nice table for your front matter and also renders your local images. With Folder Navigator and Multi-Tabs features you can open your site folder and edit multiple posts at once. And with QuickOpen you can quickly open one of your posts without having to remember the post's filename. Select an editor style that fits your personality. You can choose from a number of pre-packaged styles for both editor and preview. If you don't like one of the pre-packaged styles, you can download and use one from a list of community supported styles. Or if you are feeling a little bit of adventurous then you can write your own styles and share with us. LightPaper also allows you to apply styles to individual documents and previews which is great if you need high contrast and/or large fonts for presentation, for an example. Switch to Distraction Free Mode when you need to focus on one paragraph as you are writing.